There is something about the media portrayal of serial killers that instantly turns them into even more frightening figures. They will always choose the most scary portrait available to splash over their front pages, but the thing that really upsets their readers is the name given to these murderers. The name is frequently connected to the locality where the crimes are being committed, i.e the Yorkshire Ripper or the Moors Murderers. The subtext is that if you are unfortunate enough to be living in this locality you are already as good as dead. Sometimes the name given also depicts the method of killing as in the London Hammer Murderer, a title virtually guaranteed to have the citizens of the capital’s imaginations working overtime. Some of these killers evoke more frightening reactions than others but one name stood out through Capricorn Research’s childhood. It was so descriptive and emphatic that most of the inhabitants of Massachusetts must have walked around feeling invisible hands closing round their throats. This was Albert DeSalvo, the notorious Boston Strangler who murdered at least 13 single women in the early 1960s. Regular readers of these articles will be well aware of Capricorn Research’s disdain for Sun sign astrology or even the obsession with all the planets by sign alone. Knowing that the Boston Strangler had the Sun in Virgo and the Moon in Taurus would be no help at all. At first glance the houses are not much help either but Capricorn Research’s experience is the things that count for most in a chart are the aspects. As a rule the Sun’s aspects are critical but a conjunction with Mercury, Venus and Neptune does not really evoke a picture of such a frightening character. By now most readers will have identified what turned Albert DeSalvo into the Boston Strangler. It is the vicious Grand Cross between the 4 nastiest planets of the lot, Mars, Saturn, Uranus and Pluto. And once we accept that this horrendous astrological pattern is capable of murder the rest of the chart starts to make more sense. De Salvo was also known as the “Phantom Strangler” due to his uncanny ability to get women to trust him. Most of his victims were sexually assaulted and strangled in their apartments with their own nylon stockings. There was no sign of forced entry so the women were assumed to have voluntarily allowed him into their homes. This continued to be the case despite the enormous media publicity that would have discouraged women from admitting strangers into their homes after the first few murders. This is presumably where De Salvo’s Sun / Venus / Neptune conjunction in Virgo came in very handy. He was apparently such an attractive gentle figure that he charmed ( Venus ) and deceived ( Neptune ) his victims into trusting him. This is quite common amongst serial killers. In Capricorn Research’s collection of 193 of them one of the most common aspects is the Venus / Jupiter conjunction which scores 163 % of the expected figure. It shows the capacity to attract their victims to them in the first place. When he confessed, people who knew him personally did not believe him capable of the vicious crimes. This perception is quite common amongst serial killers. They probably just saw the Sun, Venus, Neptune conjunction and the Moon in Taurus. Capricorn Research doesn’t normally go in for minor aspects but it is worth pointing out that DeSalvo’s exact Venus / Neptune conjunction is semisquare both Mars and Pluto. This Venus / Neptune may point to the fact that the equipment used to kill them were their own stockings. His rising sign of course is Scorpio. The Ascendant is how the person appears to others and there is no better sign at hiding their real motivations and masking their true nature. The Ascendant is opposite the Moon in Taurus in the 7th house. The Moon in Taurus is such an attractive and sympathetic figure, who wouldn’t want to invite such a person into their 7th house. However this Moon brings with it the opposition to the Scorpio Ascendant and such a Moon is not so sweet. So when would all this happen. Naturally we would look to the transits of Pluto. As always I feel its only fair to point out that Pluto moves so slowly it will usually only make one major transit to any particular point during lifetime. 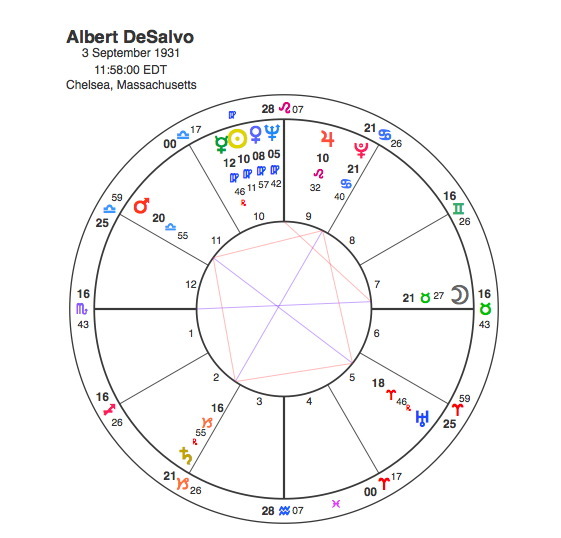 Albert DeSalvo did not live long enough to witness Pluto making another connection with his Grand Cross. It did however have to conjunct his Sun. When did this occur ? In 1962 – 3, and the Boston Strangler’s murders all took place between 1962 and 64. The only thing left to ask is why strangulation as the method of choice ? Our instincts and our tastes are so often the province of the Moon. DeSalvo’s Grand Cross showed his murderous tendencies, the exact Venus / Neptune conjunction pointed to his choice of weapon in nylon stockings, but it was the Moon’s placing in Taurus that made him choose strangulation. After all Taurus does rule the throat. What a murderous grand cross. Reminds me a bit of the grand cross we all had experienced in 2014.